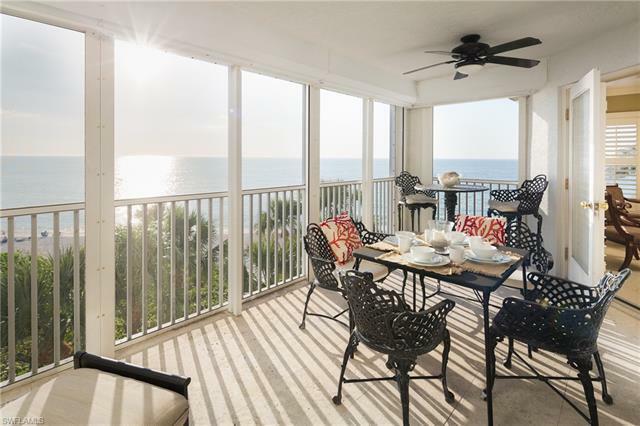 Never miss a sunset - ABSOLUTELY STUNNING GULF OF MEXICO VIEWS! Phoenician Sands is a secluded and gated beachfront complex featuring just 10 private residences located within two mid-rise towers. Each tower boasts just one elegant residence per floor. Sandwiched between the Ritz Carlton Beach Resort and the adjacient Turtle Club fine dining beach restaurant the location couldn't be pinpointed any more desirable. The upgraded interior of this condo charms with Cherry custom cabinetry and built-ins, 9 foot ceilings, stone floors and bathrooms throughout with custom lighting and plantation shutter finishes. Naples entertainment delights MERACTO and WATERSIDE shops are just minutes away. Sleep 4 (one King, one Queen).